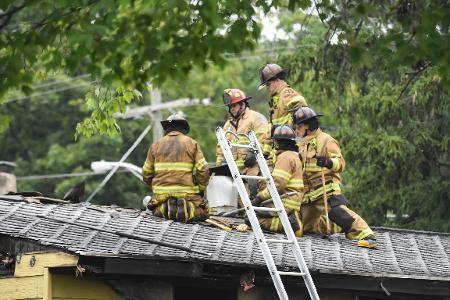 Michelle Davies | The Journal Gazette: Fort Wayne firefighters check for hot spots on the roof of a home after extinguishing a fire in the 5600 block of South Harrison Street on Wednesday morning. When the woman arrived at Vickie Maiden's front door this morning, she was hysterical, smelled like gasoline and covered in burns to her shoulders, back and chest, Maiden said. The woman was with her ex-husband who told Maiden he poured gasoline and set fire to their home. Maiden, who lives next door, said she witnessed the man being arrested on the lawn in front of the home he had shared with his ex-wife and two grandsons. 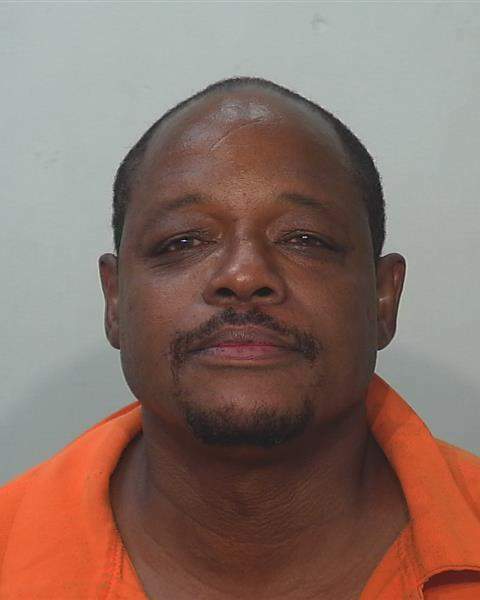 Eddie Lee Caldwell, 54, was arrested today on charges of arson and invasion of privacy in the fire that started around 9 a.m. at 5613 S. Harrison St. The woman's name was not released by authorities. The woman was taken to a hospital in critical condition, Deputy Fire Chief O'Connor said, though her condition likely won't be known for several days. "We cannot predict the outcome of a burn patient until three days after the injury occurs," O'Connor said. Maiden said the woman looked to be in her 50s or 60s and had only lived in the house a month before the fire. Maiden said she was familiar with the couple and that police had been called to their home to settle disputes in the short time they lived there. Maiden said the couple "came beating on my door asking us to call 911. She was naked. You could see where it had burned her skin and everything." Maiden gave the woman a bathrobe and said the victim went to sit at a picnic table, shivering. "She said she was hurting real bad and had trouble breathing. They got oxygen on her as soon as they got here," Maiden said. "All he kept saying was 'I started the fire. I started the fire.'"